By Reborn Artist MARIAN ROSS, SCOTLAND, UK. New Release, Limited Edition,'Baby Birdie' by Laura Lee Eagles. This beautiful baby has been brought to life by. Scottish Reborn Artist, Marian Ross. 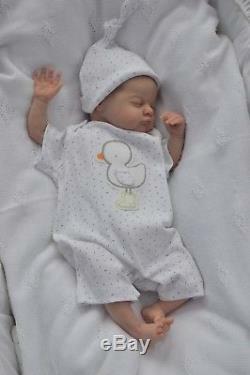 This beautiful baby has been reborn by Marian Ross from the newly released'Baby Birdie' sculpt. 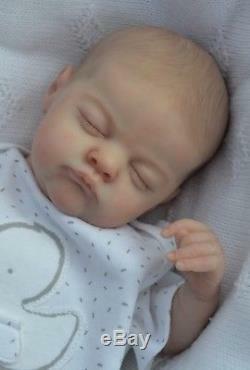 Such a beautiful baby, another wonderfully realistic sculpt from Laura Lee Eagles. 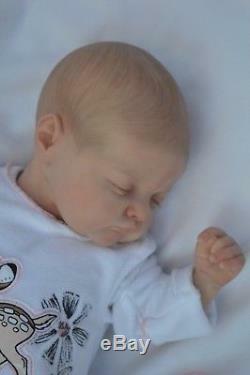 The realism of this sculpt is outstanding and it was an absolute pleasure to reborn this adorable baby! Birdie has full vinyl arms & legs and a quality, flesh coloured, cloth body. She has been hand painted using the finest quality Genesis heat-set paints. Her skin tones have been created using many colours, layers and painting methods over many days and the results are amazing! Skin has beautiful mottling and a subtle, soft textured finish giving her such an amazingly realistic look. Birdie's nose has been shaded to create depth and her little nails tipped and glossed to add to her realism. Baby has been weighted perfectly with the highest quality fillings to feel like a real baby! Limbs: Part-filled with fine glass granules and topped with quality fibre fill. Head: Filled with fibre fill and weighted with a pouch of steel pellets. 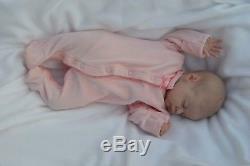 Body: Cloth body is filled with quality fibre fill. A pouch of steel pellets have been added to create extra weight. Eyes: Birdie has closed eyes, with hand-rooted eyelashes to add to her realism. Birdie has beautiful painted hair. Her hair has been completely hand-painted using many shades of black/brown/blonde to create depth and realism.... And of course it will always remain neatly in place. Her delicate, newborn eyebrows have also been hand painted. Please remember that this baby is aimed at adult collectors. She is in no way suitable for children as she contains small parts and does not conform to safety standards for toys. So all that remains is for you to enjoy the pictures of our new arrival! 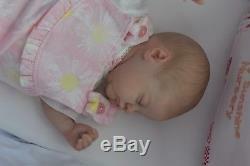 All of Birdie's pictures have been taken in natural daylight and have not been altered or enhanced in any way. Any difference in skin tone is due to different times of day and different locations around the home and garden. I take pride in ensuring that the pictures you see are a true reflection of the baby that you will take home. Birdie is the size of small real baby. Birdie will be lovingly wrapped for her journey home and will have her own birth certificate (please advise if you wish her name to be changed). 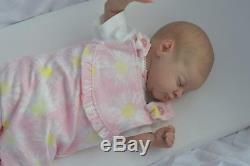 Baby is created from a limited edition'Baby Birdie' kit produced by Laura Lee Eagles. She is number 508 of only 1000 produced worldwide and she will go home supplied with her certificate of authenticity. 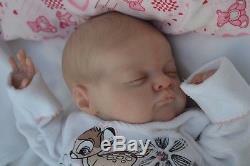 The item "MARIAN ROSS Reborn Newborn Baby Girl Doll BIRDIE LAURA LEE EAGLES Ltd Edition" is in sale since Sunday, September 9, 2018. This item is in the category "Dolls & Bears\Dolls, Clothing & Accessories\Artist & Handmade Dolls\Reborn Dolls & Accessories\Reborn Dolls". The seller is "geo12crag" and is located in Alloa. This item can be shipped worldwide. Photographs: PLEASE SEE FULL ITEM DESCRIPTION FOR MORE PHOTOS!